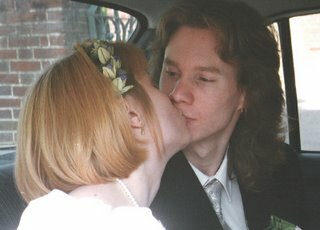 Tomorrow is our wedding anniversary. Nine years - which these days is probably quite impressive! We've both been married before - her to a jealous, possessive, violent alcoholic; me to the moodiest and second-most self-centred person in the known universe - so it's hardly surprising that neither marriage lasted. I actually remember on my first wedding day pushing away the feelings of doubt with the thought "oh well, if it doesn't work out we can always get divorced in ten years time" (it turned out to be less than three). With me and Sarah though things are very different. Basically, we just sort of "gel". I can't imagine us not being together, and there's certainly never been anyone else I've wanted to reproduce with. And nothing has diminished over the years. She's still got the same "sunny" personality that she had when we first met, and she's still a babe (cute and girly, slightly hippyish, innocent looking but with a look in the eye that gives just a glimpse of the solid core of wanton filth inside). There's nothing else I need to say - I'm not going to make my readers feel ill by getting all slushy, so I'll just end with a picture.